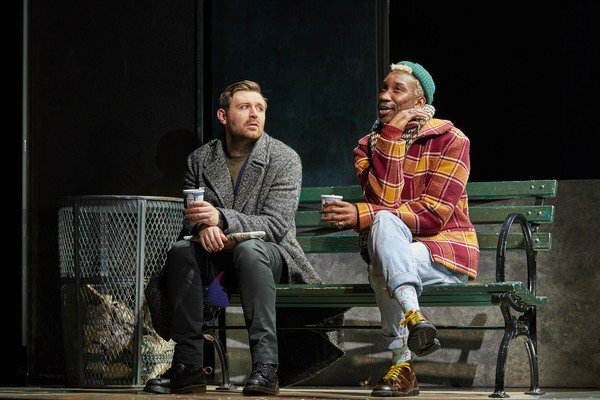 When Susan Brown step out, obscured by Rabbi beard and hat, to utter those words and open Angels in America this Saturday, it is a milestone moment. 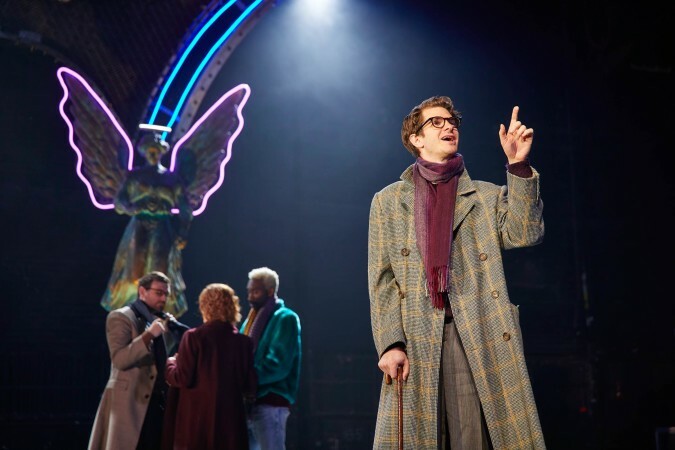 26 years, 4 months and 2 days (yes, exactly) after opening on Broadway the Angels have finally flown home, via London. There’s a sense that once again in this play’s history, London quietly created something quite special out of this iconic American play. It’s right that it’s Brown who opens the play. The formidable, often overlooked actress Broadway probably has never heard of but should have. Because despite the star line up above the title there’s a quiet, yes quite British confidence, about a production filled with non-Americans taking on this icon of British theatre. Much like the doubling in the play, the original London production was a ‘double’ of the Broadway (and Los Angeles) productions happening simultaneously. And yet, through quirks of logistics, the National Theatre ended up shaping the history of this now canonised part of American theatrical history. As Ethel Rosenberg would have it (also played by Brown, also in an iconic hat) and these Angels have been flown back to Broadway for the first time. But as it’s taken 25 years, why, and how is this play still important? And what if anything makes this production worthy of its place in Angels history. Which could as easily have been spoken today, as 25 years ago. The politics, of course remain worryingly current – not least because of the legacy of one Roy Cohn continuing to stretch to the White House today. The fight against Right-Wing politics feels more current than in the first staging- when America was moving into the Clinton era with hope and optimism. Reviving this play on Broadway during the Obama years would have felt like a very different piece- historical, reflective. Now, again it is current, urgent almost a call to action. While the politics endure, ever cyclical perhaps, it’s the Philosophy that endures beyond the practically political. The parallels between conservatism’s philosophy of non-intervention, the wider American philosophy of individualism, and the literal inaction of Reagan’s government seem clear. But more so these all-knowing but ultimately powerless creaturesdoomed to inaction and useless bureaucracy-the ‘angel of history’, a heavenly being who witnesses the disasters of the past and present but can do nothing about them. Abandoned by God and propelled ever forward by the ‘storm of progress’ but powerless, it feels like an incredibly modern lesson to learn. And the lessons in Kushner’s play feel strikingly current. Where else in theatre does the grand philosophical, the political, the historical and the domestic drama sit so effortless side by side. 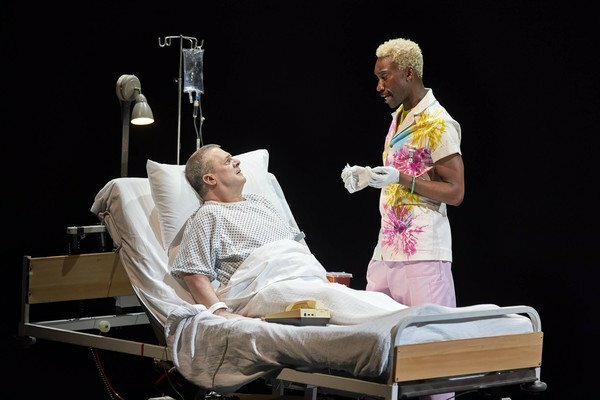 Rarely does it make so much sense to meld a political rant taking in Reagan, Race and AIDS, alongside the jealousy and grief of a lost lover? Where else do select decisions of the Supreme Court as illustrations of political corruption form the basis of a fist fight and a breakup. But in Kushner’s writing, religion melds into politics and philosophy. Morality of Capitalism with Jewish Mythology. And for all that this should make no sense, it makes perfect sense. Is what Prior asking first for himself, and then offering as a blessing to the audience. It’s a theory, a philosophy and instruction that is universal. 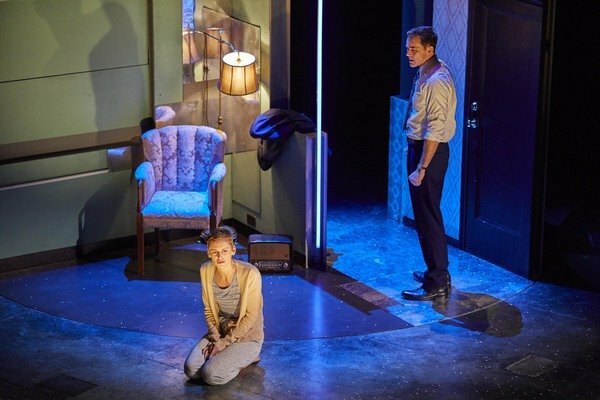 And it’s the heart of Kushner’s philosophy, and what makes this production such an optimistic, hopeful take on the play. It’s a play for now, a play for all times. The setting may be historical now. A distance memory for some, another time altogether for others. But it’s themes are universal. And it’s characters more so. It’s a story of humanity, of love and loss. It’s also a story of growing and indeed growing up, no matter what your age in life. It’s about those moments that crash in, like and Angel through a ceiling, and shatter our lives. All the characters are broken by the things life throws at them, and all (almost all) are healed in one way or another. When Prior pleads for ‘More Life’ talking about the ‘addiction of being alive’ it’s that element within all of us to keep going, even through the worst of it all. When Harper talks of ‘a kind of painful progress’ we each feel our own sense of that. And it’s a thing to witness for an audience. How rare is it to sit with characters, in the theatre, for an entire day? To be absorbed by their lives completely, to live in that world. And then be cast out in it again. That’s the magic of what Kushner writes- sure there is magic in it, with Angels and ghosts- but it’s the people he creates that are so magical. 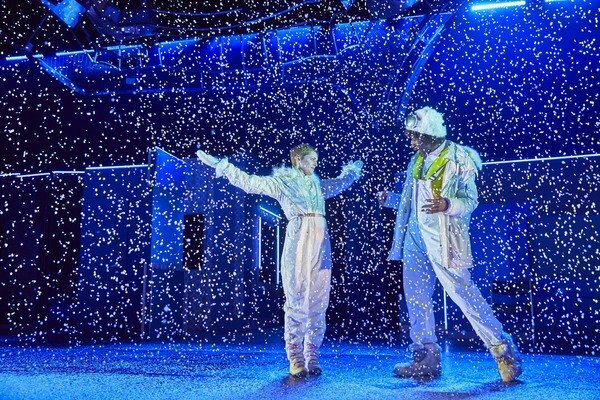 Rarely does theatre give us such rounded characters, such full arcs of story. Where we know so much, but also so little that even after all that time there’s still more we wish we could know. But he knows how to give us just enough, to watch them, to feel with them and perhaps to learn from them. Indeed. This production is a gift. Even for those who know the play- make that think they know the play-it feels like new work. Not only for the continued relevance of the ideas, the philosophy behind it. 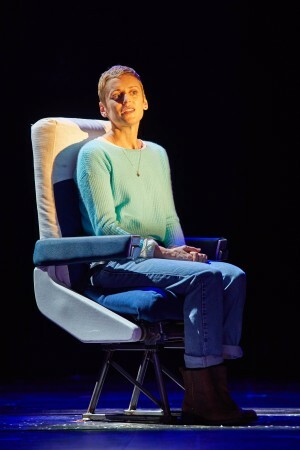 But for the ‘more life’ Marianne Elliott and the team breathe into it. Not that it was ever stale to begin with. But to come back, 25 years later, it’s only worth doing with a bang. And does it bang. With the rug ripped (quite literally in fact) from under the characters and the audience. Elliott at once explodes the world Kushner wrote, and strips it down to it’s core. There is a beautiful, almost musical, balance between the force of theatricality in the work, and a delicacy and precision of actor direction. 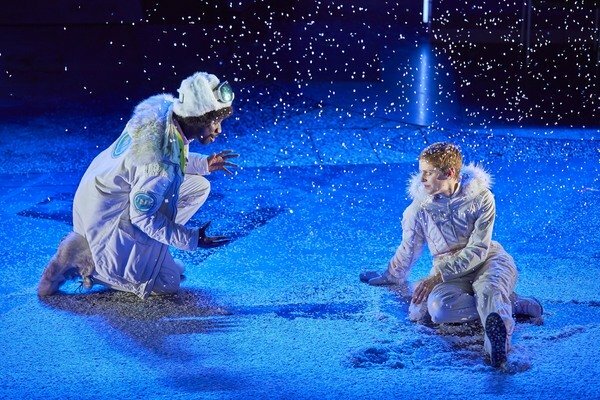 A director who took a step back from the play, in order to fully immerse herself in it. She sees it as the whole- from the biggest set pieces to the tiniest detail- but every detail, and every performance is accounted for. This is a play that could be done with a black box and 4 chairs and still sing. The real skill is to give it all the theatrical tricks the writing could demand, and still expose the rawness and the magic of Kushner’s writing and hand that back to the actors. And that is what truly makes this a triumphant return to the play. 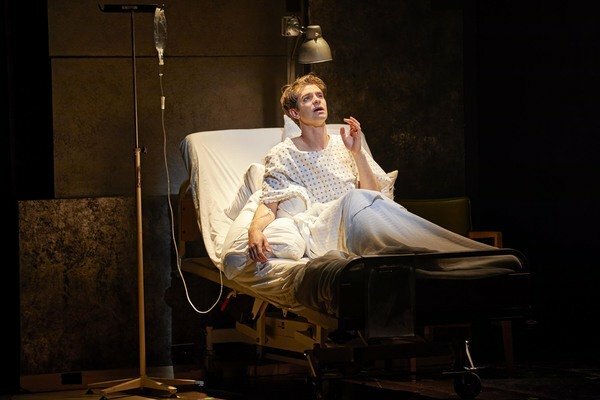 From Andrew Garfield’s raw, honest journey as Prior. From the quietly fearful, to shrieking hysteria and back again. He seems to pull himself through the 8 hours with Prior’s own force of will to succeed. Towards a moment of blurred lines between actor and character at the epilogue. Paralleled by Denise Gough’s gut wrenchingly heart-breaking Harper. Who unravels but is pieced back together in front of the audience. Gough delivers her with strength and a wry humour that shows her as vulnerable, but never weak. Alongside her the formidable strength of Susan Brown’s Hannah. Bringing depth to a character who is easy to overlook, but who pulls together both narrative and emotional strands of the story. Brown takes on this, and the mantle of Ethel Rosenberg- too easy to caricature, but as real as Hannah and treated with equal respect in Brown’s hands. Nathan Stewart Jarrett makes Belize look effortless. When the comic relief he brings to scenes with Roy, is anything but and the role of a friend breaking his heart over a loved one is shown with sensitivity, and intelligence. Equally intelligent is James McArdle’s tour de force as Louis. Breaking down the character to the minutiae of the dialogue and building him back up again. There’s such heart to the character so easy to hate it’s a conflicting but fascinating performance. While Nathan Lane takes the fictionalised Roy Cohn and finds his comedic heart, and the human element inside the politics of the monster. And amid all the Angel, crashes through given real agency, and personality amid the debris she finds herself in. 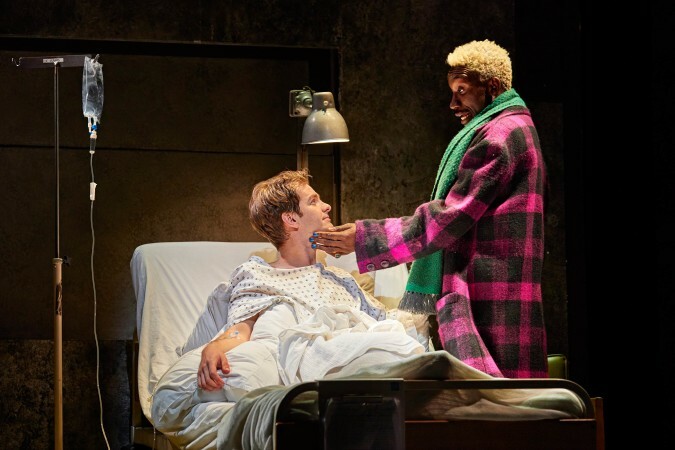 What after all is the point of re-staging Angels in America25 years later if you don’t re-imagine what the Angel might be? What was the point of a triumphant return to the National Theatre, graduating from the black box studio of the Cottesloe to the vacuous and notoriously difficult Lyttleton if you aren’t going to use that? 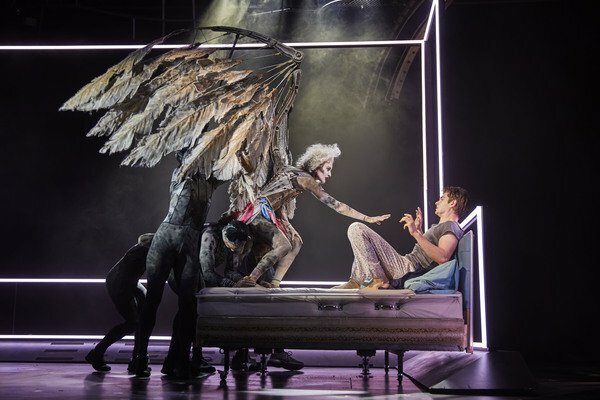 And why fly those Angels back to Broadway if it isn’t with a bang (or crash, in the case of the Angel). The point is this play doesn’t need all that. This play can be done on the strength of 8 brilliant actors alone, it should be. But to craft all that- to direct 8 incredibly challenging performers, in a complex play, and to manage such masterful strokes of design, stagecraft and theatricality. That’s why you do a big revival of this play. And that’s why the National Theatre and Broadway revival will go down in both the history of Angelsbut the history of Broadway and the National Theatre as something quite special. And it’s important that it’s this director, this cast now. It’s important that a woman is steering this production. Not least the not-so-simple act of having women directing flagship productions. For women in the industry to see a woman at the helm of this iconic play, on these iconic stages. Maybe for men that doesn’t seem such a big deal, but for women that’s galvanizing. And indeed, women like Elliott who help other women up the ladder through their platform, and practical means. We should keep mentioning these women at the top, until we get to a point we don’t have to. That aside, a woman directing this play is important. 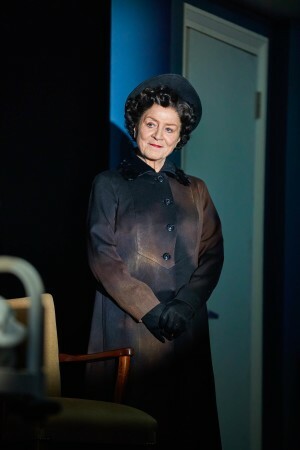 A woman who remembers the era it’s set in but didn’t ‘live’ the world of the play it in the same way previous directors have, brings something different to the play. Another perspective, less personal, and with it more honest to the characters. Kushner also wrote great women. It’s as much Harper’s story as it is Prior’s. This production shows that. It shows Hannah, Ethel and all they go through in a way that has been overlooked in other productions. Those women’s voices in the play feel really ‘heard’ for the first time here. And Elliott, irrespective of gender has brought this play back with such passion and dedication. Over two years working directly on it, at least three working towards it. This author personally understands that dedication to the madness that is Angels, but professionally that’s a lot to ask of anyone. But the passion shines through, the love of the piece, the sense of its importance. And that also emanates from this cast. 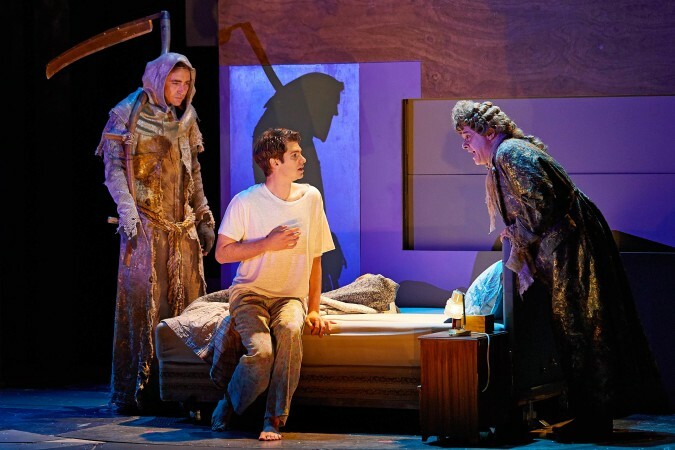 Angels is an ensemble piece, and it should be impossible to truly isolate any one part. Through those thousands of lines of dialogue, the dense prose and poetry of Kushner’s writing. Through the epic scale of the production and steering this diverse talented group of people, something urgent, relevant and beautiful has burst through. Despite thousands of words of writing, despite the eloquence of Kushner’s writing it comes down to a feeling. An entirely overwhelming moment that occurs at the end of this play. After almost 8 hours in the theatre, something that has been creeping in, takes over. Part hope, part elation part some ineffable philosophical, political, emotional, spiritual alchemy of all that has gone before. Or perhaps it’s just called hope. ‘There is an ethical obligation to hope’ Kushner once said. And that’s what this play brings back. That is why is matters now. That is why this production matters. It captures that hope. The play instructs. 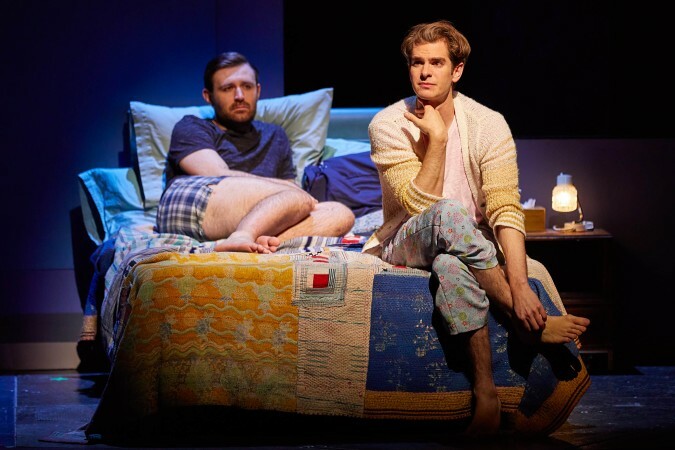 Late, on Sunday night Andrew Garfield will say those words and Angels will officially be back on Broadway for the first time in 26 years, 4 months and 2 days.